She wears reading glasses with plastic frames or contacts. She has tattoo of a rose in yellow ink on her right hand, a tattoo of a peace sign on her left hand. Some of her teeth have fillings, others have caps, and she has pierced ears. Unknown. Donna was last seen between 8:00 a.m. and 8:30 a.m. at her residence in the vicinity of Avondale Avenue and Old Birmingham Highway in Sylacauga, Alabama. 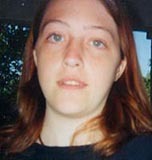 Donna walked to a convenience store three to four blocks away from her house but never returned. Her whereabouts are unknown and her case remains unsolved.